GrooveWasher G2 Fluid is the result of years of research and testing. The formula was guided by the D series fluids of the 1970s. 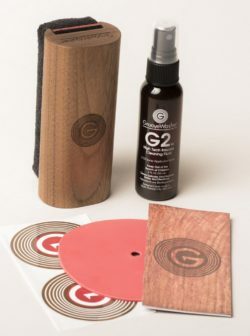 G2 is perfectly safe for vinyl records. The ingredients are balanced for effective cleaning without rinsing. Evaporates quickly after cleaning per instructions. Anti-static action on contact. Honest cleaning to release the honest sound of the recording. 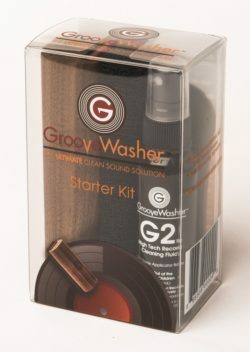 Designed for use with the GrooveWasher cleaning pads. But you can use G2 Fluid with your preferred absorbent brush or fabric. NOTE: Carbon fiber brushes are non-absorbent and not designed for wet cleaning. Use of G2 Fluid with a carbon fiber brush is not recommended. G2 does not fix scratches or scuffs. Once the signal in the microgroove is lost, nothing will recover it. Some vinyl cleaning fluids on the market are plain distilled water with limited cleaning action. Others have a high level of alcohol which can harm vinyl records. Some leave a layer in the microgroove that reduces sound fidelity. Surfactants: State of the art detergents dissolve and suspend fingerprints and other oily grime. Super wetting agent: A specialty chemical that reduces the G2 Fluid’s surface tension to reach the bottom of the groove. 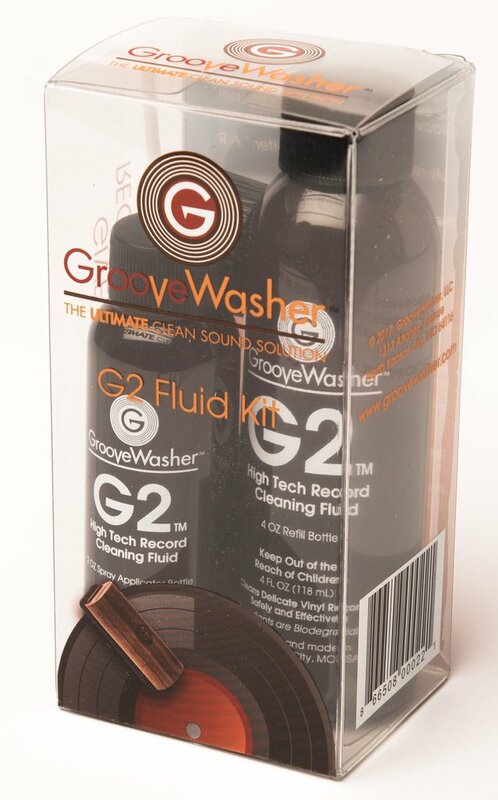 When you spray G2 Fluid on a record you can see it spread down the grooves. Emulsifiers: Holds the oils, dirt, mildew and microdust particles in suspension. Then the microfiber fabric cleaning pad wipes and pulls the dirt-filled solution from the record surface. Purified, deionized water: Powerful carrier for the active cleaning ingredients. Eliminates static electric charges on the record’s surface on contact. 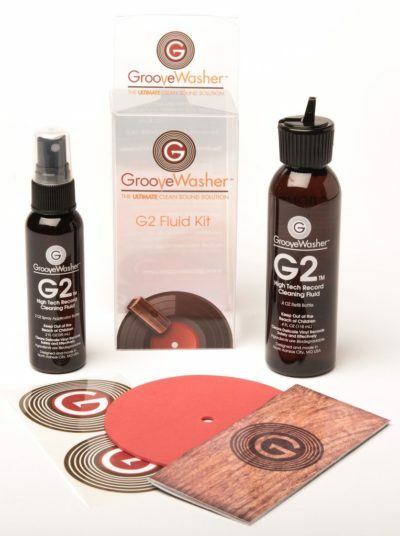 G2 Record Cleaning Fluid is formulated and made by GrooveWasher in North Kansas City, MO, USA.